Congratulations to the incoming Executive Board members who will begin their terms to serve TATS and its members at the Annual Meeting next January. To learn more about each of the candidates for office, visit the TATS Election Page at http://www.tnata.org/2015-tats-elections. Voting can be completed online via this link OR members can submit a written ballot to Kevin Wolf, TATS Parliamentarian. The preferred method of communication is online. Written ballots must be sent by USPS mail to 1527 Shagbark Trail, Murfreesboro, TN 37130. Written ballots are available here. Voting ends at midnight ET on May 15th, 2015. 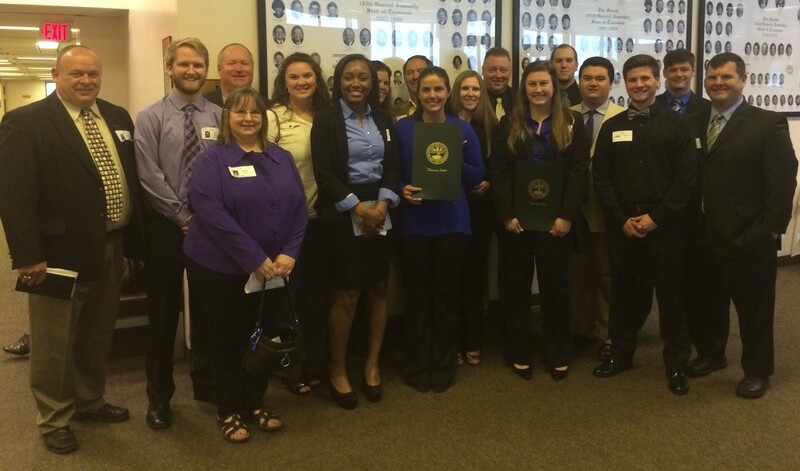 On Tuesday April 7th, 17 TATS members, ascended onto Capitol Hill for our “day on the hill”. We were accompanied by Zach Bates, our legislative liaison, who had set several appointments with legislators in advance. While we did not have a specific want or need from lawmakers at this time we were able to continue to foster relationships previously established as well as begin some anew. It was a good opportunity for athletic trainers to say thank you for the work that had been done with regard to the concussion bill and the protection of health and wellbeing of the athletes that we serve. We even had one legislator who agreed to sign on to support the sudden cardiac bill when we made him aware of the current legislation. Another byproduct of our meeting was the initiation of talks, with the members of the executive board, to develop a strategic plan as to how we go about strengthening our relationships with legislators and being more of a presence on Capitol Hill. A special shout out goes to the 10 MTSU athletic training students who showed to support our efforts; Amanda Januchowski, Brandi Caruso, Chris Miles, Colin Biegas, Dabrisha Garner, Isaiah Foster, Matt Warner, McKenzie Leonard, Pali Dingler, and Trey Link. Any Certified-Active or Certified-Retired member of TATS is eligible to nominate their colleagues for the TATS Executive Board offices. To determine a TATS member’s eligibility to serve in any of these offices, please look at Article IV of the TATS by-laws on the TATS website. You can also download the most recent TATS By-Laws on the TATS website. Please send all nominations to Kevin Wolf, TATS Parliamentarian. The preferred method of communication for nominations is by e-mail at kwolfatc@yahoo.com. Nominations may also be sent by USPS mail to 1527 Shagbark Trail, Murfreesboro, TN 37130. Nominations will officially close at midnight ET on April 16, 2015.